Want to get where you’re going without having to walk or pedal a bike? Hop on the Razor A2 Kick Scooter and you’ll be there in no time. Unlike electric or gas powered scooters the Razor A2 Kick Scooter is powered by you. Similar to a skateboard, you push off with your legs and propel yourself, at your own speed. You can go as fast or slow as you want. Unlike a skateboard, the Razor A2 Kick Scooter has a rear brake, wheelie bar and padded handle bars for the safety of stability, comfort, and direction. 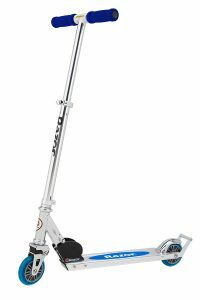 The Razor A2 Kick Scooter is great for children of all ages and even adults. This scooter will also grow with your child to allow many years of use! The Razor A2 Kick Scooter has got it all. With so many new features and a patented design this scooter will not disappoint. While most kick scooters are made of cheap, flimsy materials, the Razor A2 Kick Scooter is built to endure even the toughest wear and tear! Made from high-quality materials that were built to last. Let’s take a look at what sets the Razor A2 Kick Scooter apart from the rest. A variety of 7 different colors to choose from. Great for boys and girls of all ages who just have to have their favorite color. Red, purple, green and black is just a few of the many options. Space saver design allows for easy storage and transport. Handle bar folds down onto the deck leaving a small footprint. Only weighs 6 pounds and folds so small it can even fit in a gym bag. Light enough to carry around and take on the go without being a hassle. Made out of durable aircraft-grade aluminum that will take years of wear and tear; this scooter was definitely built to last. 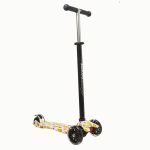 The durable frame is overall less likely to dent, scratch, rust and bend like other poorly made kick scooters. Grip any terrain with the heavy-duty urethane 4 inch wide in-line wheels. Much like the wheels on in-line skates, these urethane wheels provide the flexibility of rubber wheels with the durability and resistance of metal wheels. Also resistant to oil, water, and tearing. Such durable wheels mean there is no need for costly and bothersome wheel replacement. The new design of the front wheel springless shock suspension combined with the urethane wheels make almost any terrain feel smooth. It makes for a smooth effortless ride every time. Features an all-new wheelie bar for extra safety and stability. This integrated wheelie bar allows for tricks to be done safely. The adjustable, padded, handlebars allow the scooter to grow as your child grows with three different, hassle-free, height adjustments. That feature combined with the 143-pound weight capacity makes this scooter a perfect fit for children and adults of all sizes and ages. This scooter is recommended for ages 5 and up. The specially designed rear brake located on the back fender allows you to adjust your speed. You can quickly slow down or come to a complete stop. This safety feature helps stop collisions and allows you to be in complete control. The Razor A2 Kick Scooter really does have it all! Having a high performance kick scooter that is lightweight and compact makes it easy to carry and take on the go. You can ride in style with the sleek look and feel of the Razor A2 Kick Scooter. Have a smooth ride every time with the new suspension design. Cool tricks can be done safely with the all-new wheelie bar. Rear fender break may take some getting used to compared to the usual handlebar breaking system. A little too heavy for very young children to tote around on the go. Not ideal for all adults with the 143 pound weight requirements. Everyone can have fun with the Razor A2 Kick Scooter. The kids will love getting around on this stylish scooter, racing their friends, or doing cool tricks. Great for those family bike rides or fold it up and take it to the park. Adults can have fun too! Great for getting you wherever you need to go and get some play time in with the kids. 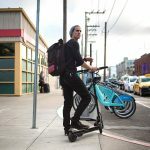 One of the safest kick scooters on the market thanks to the integrated wheelie bar and rear fender brake. This scooter has a lot to offer for everyone! So whether you’re looking for a great scooter for yourself or the kids the Razor A2 Kick Scooter is right for you.